* Please click on the link below to print a copy of the WHC Product Order Form that can be filled out and mailed in to the WHC Office with the appropriate fees. For WHC Level II & III Organizations past and present who have received WHC Trail Grant project funds. 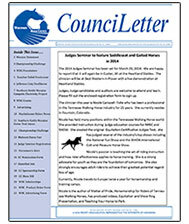 WHC publishes a monthly newsletter with articles, press releases, current equine events in Wisconsin, a classified section, and news about WHC happenings, including Midwest Horse Fair. Available to WHC members and selected affiliate organizations.